We tend to use image textures most of the time. Price goes very high with higher resolutions like 4k/8k textures. Most websites don’t provide bump, height, specularity, roughness maps, etc. Those websites which do, take extra charge for them. Image textures can be used only after the object/mesh has been carefully UV unwrapped. UV unwrapping for regular mesh without high poly count might seem easy. But if you working towards photorealism then, you’ll definitely need high-poly objects. It gets frustrating to UV unwrap a high-poly mesh and takes a long time to map the image perfectly on it. 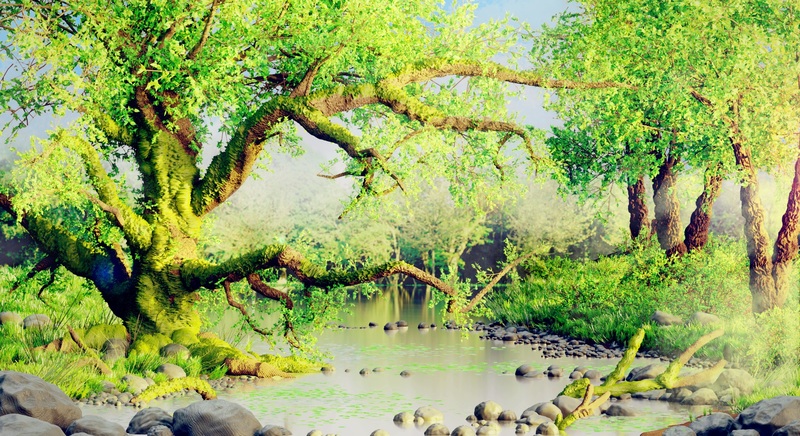 Especially nature materials like rocks, sand, soil, tree barks, moss and other commonly used materials are not available online, or they are too expensive with low-res images. 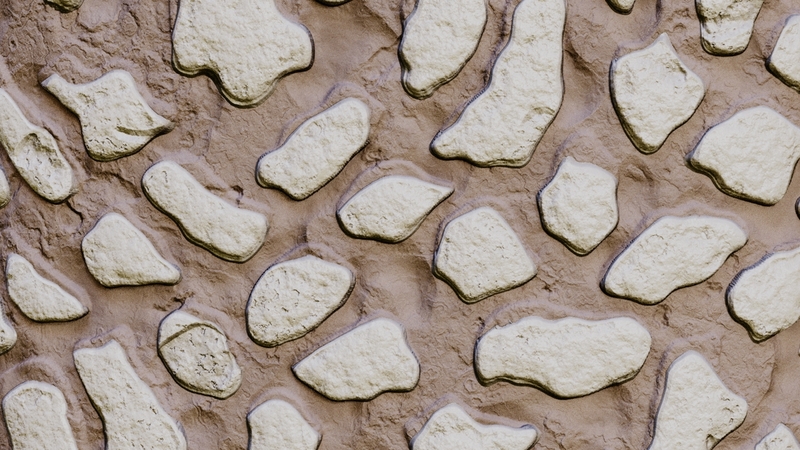 And there are very few seamless textures available. Because after all, they are photos shot using a camera and you cannot expect to have much control over the settings and customization. You can make changes to the image texture but that requires external photo-editing software, which again makes the process tedious and time consuming. If that is the case, then why do artists still rely on image textures and image textures still seem to be a popular trend in the CG industry? …because there are some drawbacks of most procedural shaders. 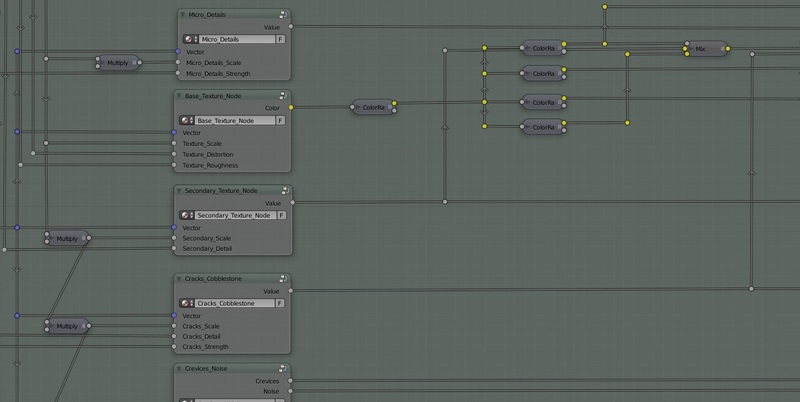 Procedural nodes are hard to understand and may take a long time to master. It has its own learning curve. Even after learning the basics of procedural texturing, it needs a lot of brainstorming and hacking to make a particular material look photo-realistic. Procedural materials, rather quality procedural materials, are rare. Some websites have tons of free procedural materials for download, but they are far from realism. They can hardly be a replacement for image textures. And especially textures related to nature scenes are hardly available. When it comes to procedural materials, it is very scary – trying to change a particular attribute of the material using the nodes. Even making a small change in scale needs you to understand how the entire node system works, which is practically impossible because it is time consuming and most artists are always on tight schedule. Imperfections are hard to be faked using procedural nodes. 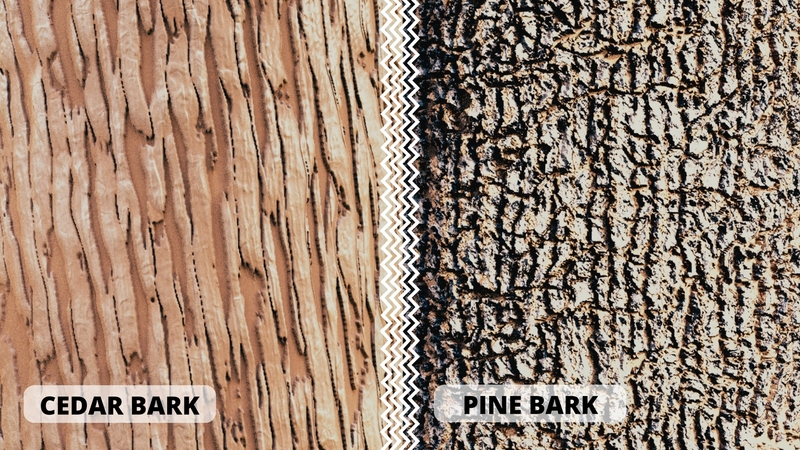 In such cases you need an extra overlay image of imperfections and need good amount of editing, which breaks the initial purpose of the procedural materials. 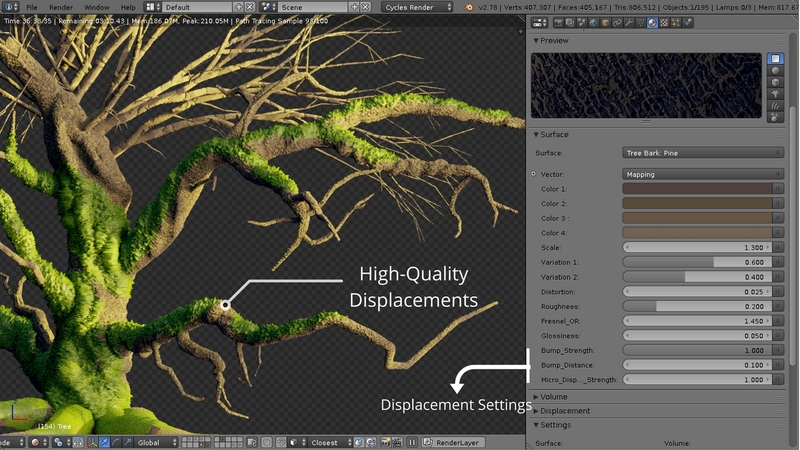 Smart Shaders VOL II is the ultimate solution which will help you focus on the artistic side. 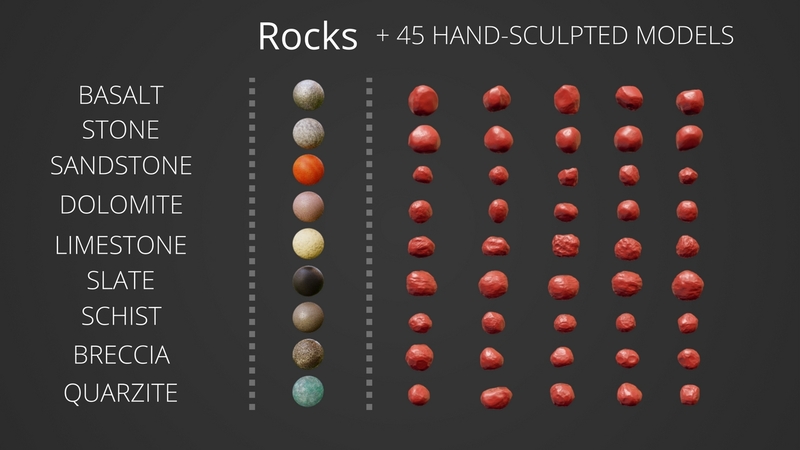 You can also control the level of detail you want for the rock sculpts using the Multi-Resolution Modifier from the modifiers panel. So you need not worry about the resolution because procedurally generated textures have practically no limit on the texture resolution at all. And much care has been taken to make them photorealistic. The materials have a wide range of variations included which can be easily customized using the material settings from the materials panel. Most materials even have an exclusive slider meant for controlling variation amount. The product really focuses on high quality displacements. With the introduction of micro-displacements, it has never been more realistic. Since, micro-displacement is still an experimental feature; the ‘bump’ displacement has still been implemented in combination with it. Special attention has been put to the natural imperfections, like cracks and crevices, undulations, decals, wear and tear, etc. Moreover, the material settings make it more flexible. These materials doesn’t need UV unwrapping and automatically maps the textures perfectly. No more UV mapping troubles. Just plug and play! Still, if you’d like to use UV mapping you can switch the mapping back to UV from the materials settings. #6 It has all you need! Smart Shaders VOL II provides a wide range of materials artists need every day to create jaw-dropping nature renders. All of them are seamless. If you still want a different shader, you can make little tweaks to the nodes to get a completely different shader in a matter of seconds. And it has never been easier to customize the node tree – the nodes have been categorized into smaller units of node groups. The nodes-setup has enough context so that you can understand how it works, easily! 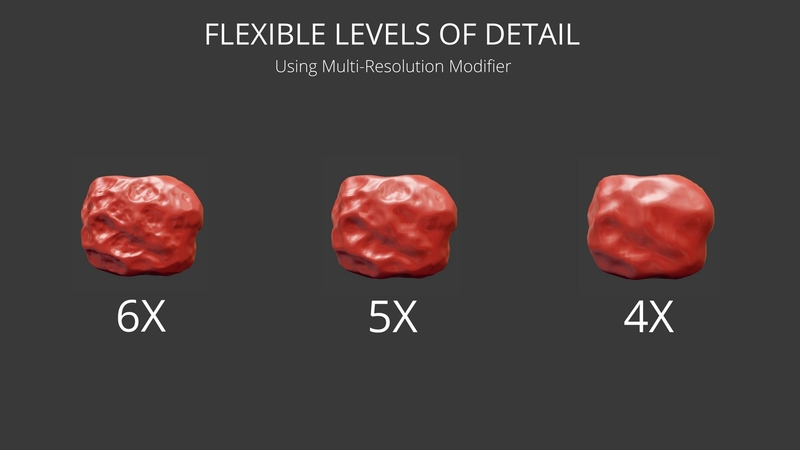 Procedural Materials are the king of flexibility. You can tweak most of the settings, like scale, color, displacements, variation, crevices strength, etc. right from the materials panel. You can still dive into the node system, which has been broken down into smaller pieces, and make quick changes. 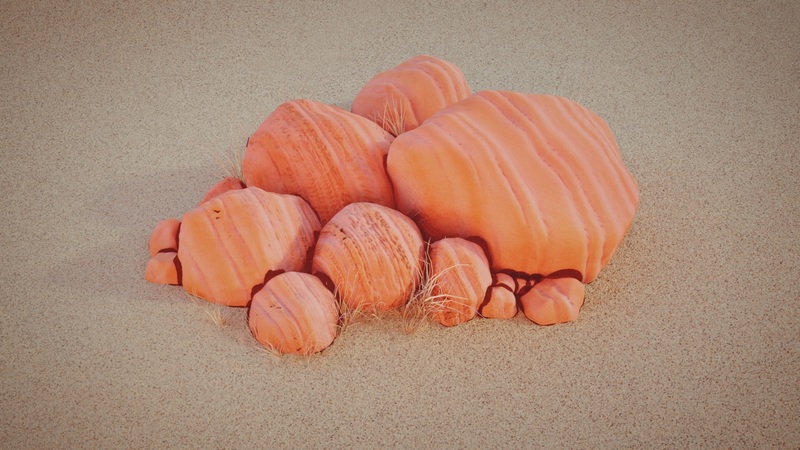 Using Smart Shaders VOL II you can rule out the stress and frustrations that come with the long and tedious learning process of procedural materials. You don’t need to know what every node does. You can easily tweak any parameter without even messing around with the nodes. Good procedural materials are hard to find. There are tons of free procedural materials available online but they are not even close to photorealism. Even if you come across a good procedural material it’s often a single material which can hardly solve any problem. Smart Shaders is a great solution and this volume is picture perfect for almost all kinds of nature scenes. You get all the nature materials in a single pack – you don’t need anything else. With Smart Shaders VOL II, even a newbie can customize most of the parameters using the materials panel, without touching the nodes at all. 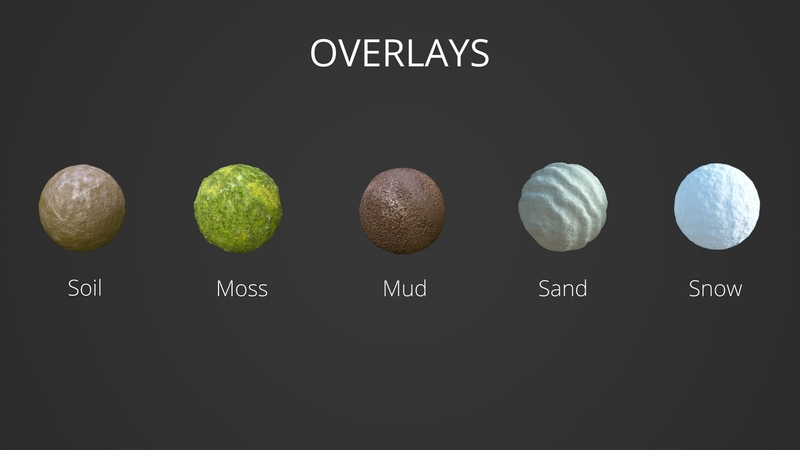 Each one of the materials in Smart Shaders VOL II, itself took well over 2-3 days to create. 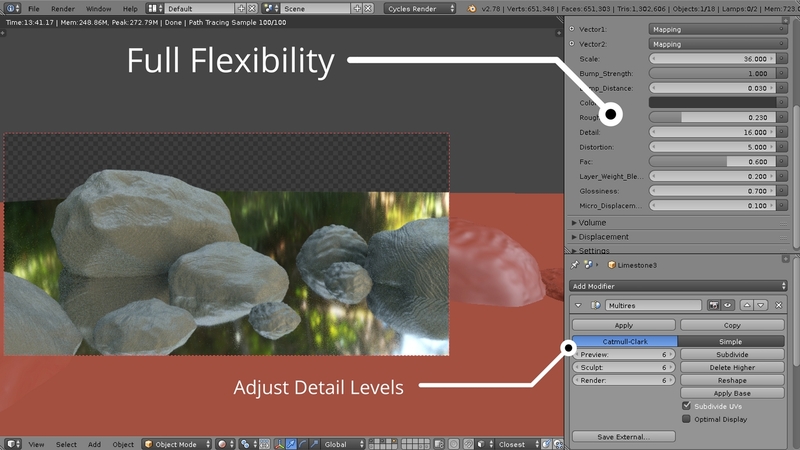 Now you don’t have to spend time on creating materials for your next nature render. So, if you are on a tight schedule, Smart Shaders VOL II is the best choice. 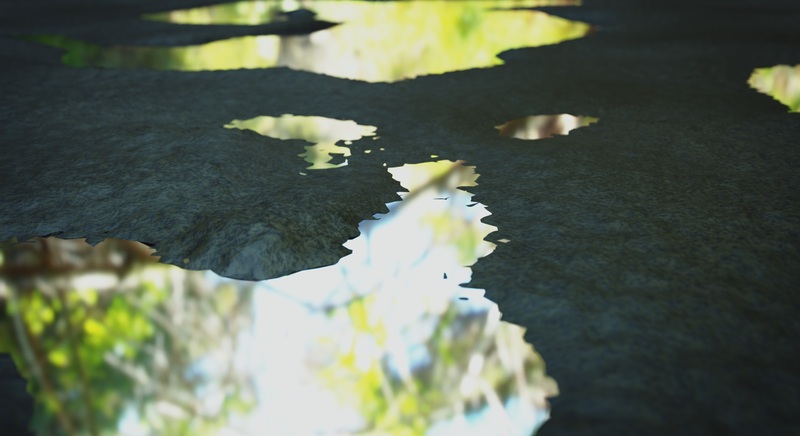 Smart Shaders VOL II comes with the Micro-Displacements feature. Unlike the bump maps or the normal maps, used traditionally, micro-displacement causes geometrical displacements to the surface of the mesh. You not need to add any additional layers of imperfections because each material comes with imperfections added by default. Here's a little video, if you are not sure how to use the shader pack. Unlike most image textures available online, Smart Shaders VOL II has a quite reasonable price. After analyzing popular shader packs on the Blender Market and other popular websites, the average price per material is somewhere around $2 – $3 for mere image-based materials. In that rate, the total price (not including the price of models/assets) would be well over $ 50. And with the market rate of models/assets, the price would have easily gone higher than $ 100. That’s overkill for most of the artists. All the shaders are very good, and easy to use. Simply append the material into your scene, and apply it! It was also very easy to tweak the material settings for maximum awesomeness. ... an excellent render by Joseph Dye using Smart Shaders VOL II. Smart Shaders VOL II contains several important shaders necessary in any, and every scene involving nature. It will save hours of tedious work, trying to gather textures and make a physically accurate shader, as well as UV Unwrapping your model(s) to apply the texture. With this shader pack, no UV Unwrapping is required… It’s a plug-n’-play deal! Don’t waste anymore time. Scroll all the way up and select your package! Now! It is compressed to reduce the file size. It doesn't have any other effects. Then just append the materials, models and sculpts into your blender project and start playing around with them. You might face some issues with micro-polygon displacements as it is still an experimental feature in blender. If you want realistic results, make sure the Axis-Selector settings (present in few materials) and Scale are accurate. Play around with them until it looks correct. It is also recommended to use HDRI-Lighting to get the most photo-realistic renders. Where are the common shaders like wood, glass, metals? Smart Shaders VOL II is best suited for artists creating nature scenes, and artists who are into outdoor arch-viz that involves nature scenes. Any shader which is not commonly a part of nature or environments are not included. If you still need other shaders, you can check out Smart Shaders VOL I. At that rate, the total price (not including the price of models/assets) would be well over $ 50. 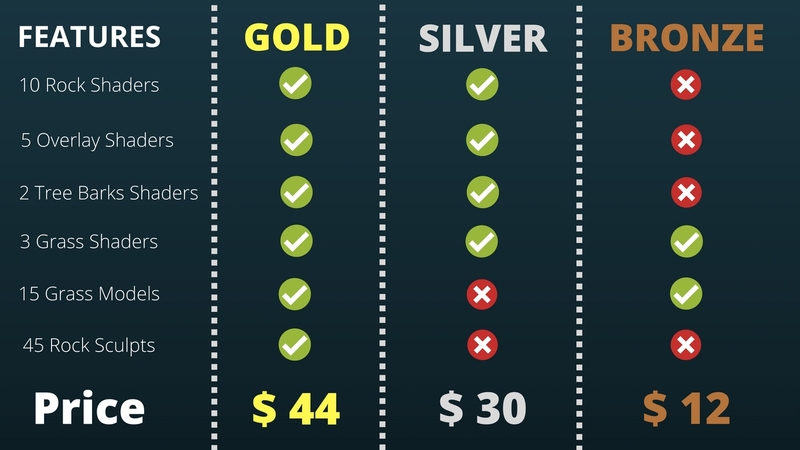 To make it affordable and enable more artists to use it, the price was settled at $1.60 per shader and $0.2 per model/asset. 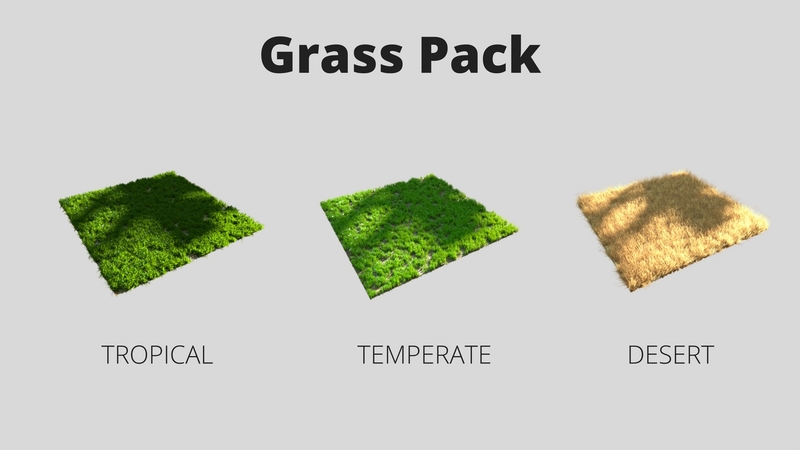 So the entire pack costs $44 in total ($1.6 x 20 shaders + $0.2 x 60 models/assets). In addition, you have three different product packages to choose from. You can buy the one you can afford. Rocks, Grass, Overlays and Barks.